Why do we talk about Sweet Spot? As you have probably heard there is a point on a tennis racket called a Sweet Spot. So what exactly is a Sweet Spot? In fact sweet spot is also known as center of percussion (aka center of the racket face). This spot provides the best “feel” when you hit groundstrokes and also provides the most stability on the shot. The official wikipedia quote: “The sweet spot is a place where a combination of factors result in a maximum response for a given amount of effort. In tennis, squash, racquetball, baseball, cricket, or golf a given swing will result in a more powerful hit if the ball strikes the racket, bat or club on the latter’s sweet spot. 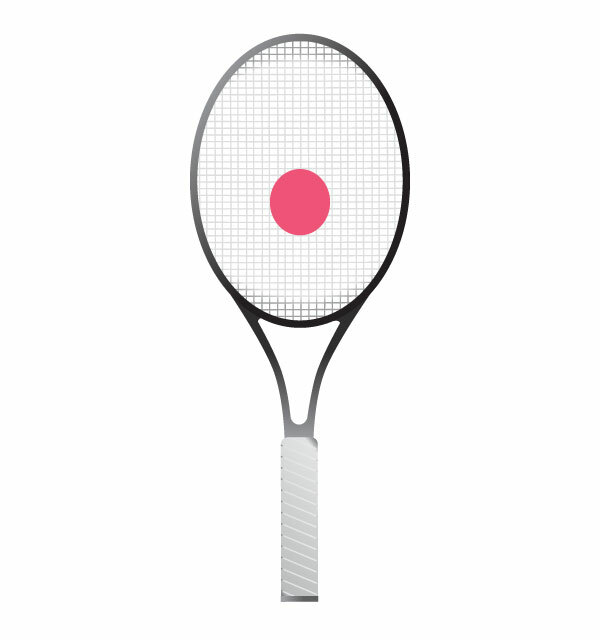 Over-sized; used by beginners can range anywhere between 100 to 140 square inches of strung surface. This enables players to hit the ball further from the sweet spot and still generate relatively good shot. Mid-sized; used by intermediate, advanced and professional players where head size ranges anywhere between 85 to 100 square inches. It is very common right now to use head sizes around 95-100 as this is the best combination to generate good racquet speed as well as have relatively large "sweet-spot" are on the racket. Standard-sized heads; impossible impossible to find anymore. It was used mainly back in the days when rackets were still made of wood. Impossible to generate any topspin.